The aircraft carrier Shenandoah barely survives multiple kamikaze attacks off the Japanese coast near Tokyo Bay. Despite death of the ship's commander and desertion of 93 men and a lieutenant commander from the burning Shenandoah, the executive officer Ben Casco, now in command, saves the crippled ship by ignoring direct orders from his task force admiral to abandon her. Hank Searls, author of 19 novels including the novelizations of Jaws 2 and Jaws: The Revenge, uses his experiences in the Navy during World War II to create a realistic wartime setting. The carrier USS Franklin served as inspiration for this novel. Aboard the battleship Washington, Searls witnessed a Japanese plane drop two bombs on the carrier, which nearly sank after raging fires detonated stored ammunition and bombs. Although this novel contains realistic battle action, the real strength lies in the personal conflicts between the book's memorable characters. Ben Casco enlists in the Navy in 1929 without completing high school, and he serves first on the battleship Nevada, but he soon leaves to pursue his dream of becoming a Navy pilot. After eight years as an enlisted pilot including an assignment aboard the carrier Lexington, he is commissioned as Lieutenant Junior Grade with an assignment in June 1941 to the new carrier Shenandoah. He fights at Pearl Harbor and Midway, where his plane finishes off the Japanese carrier Hiryu and earns him promotion to Lieutenant Commander and head of the Shenandoah's fighter squadron. The book skips forward three years to the Shenandoah anchored at Ulithi Atoll, where three huge task forces leave for an attack on Japan late in the war (probably July 1945 based on book's references to other events). The main story occurs in 1968 as Ben Casco seeks to stop Christy Lee from becoming Chief of Naval Operations. More than two decades earlier, Christy Lee, officer in charge of five-inch guns on the Shenandoah, never gives orders to fire at an incoming ohka glider bomb as he deserts the burning carrier to reach safety on a destroyer that has moved alongside the ship. Ben is the only witness, and Christy lies that he was blown off the ship by the ohka explosion, so an admiral advises Ben, after his damaged ship limps back to Pearl Harbor, not to press court-martial charges due to insufficient evidence. The author tells the history of the Shenandoah and Ben Casco in a series of flashbacks. The main flashback takes place during World War II, but then during this time several other flashbacks occur to key events that shaped Ben's career and illustrate his character. Although the author skillfully handles these flashbacks within a flashback, they delay the flow of events during the last year of the war. Even though the piloted ohka bomb had almost no success during World II, this piloted glider makes several successful attacks in the novel. Mitsubishi Type 1 (Betty) bombers carried the ohka weapon to within range of enemy ships, and then three rocket engines accelerated the ohka to over 500 miles per hour. Over 50 ohka pilots and 320 pilots and crewmen of mother planes lost their lives (Hagoromo 1973, 54), and ohka bombs sank only one destroyer and damaged seven other ships during the war (O'Neill 1999, 160). Americans usually referred to them as baka (meaning "fool" in Japanese) bombs. The first kamikaze to hit the Shenandoah is a Kate bomber carrying a 250-kg bomb, which explodes between the flight and hangar decks. As men try to put out fires and rescue the wounded, two ohka bombs hit the carrier. As the ship starts to sink, two more ohka gliders barely miss the stricken carrier. Earlier in the novel as the Shenandoah proceeds from Ulithi to Tokyo, a kamikaze pilot is rescued after he parachutes from a blazing Betty mother plane that had just released an ohka that crashed next to the carrier Lexington. This kamikaze pilot ends up playing a key role in the novel's plot. Christy Lee panics when the first kamikaze plane hits the Shenandoah, and he leaves the kamikaze and another soldier locked up in the brig when fire roars through it. Ben Casco rescues them before he goes up to the flight deck, and he finds out later that Christy was the person who had abandoned the two men. 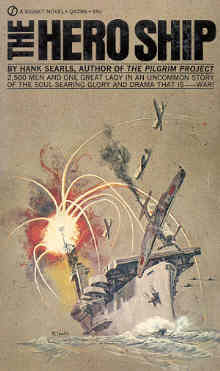 The kamikaze pilot gives a deposition regarding Christy's action, which Ben thinks he will use in a court-martial of Christy in addition the charge of deserting the ship. However, the admiral convinces him otherwise in Pearl Harbor, but in 1968 Ben wants to bring up the two charges again as Admiral Christy Lee plans to appear before a Senate committee to confirm his appointment as Chief of Naval Operations. The book reveals nothing about the captured kamikaze pilot's motivations, but an interpreter provides the leaders of Ben's task force a briefing on kamikaze weapons and pilots prior to leaving Ulithi for Japan. One officer asks whether kamikaze pilots are doped or are drunk, and he suggests fear motivates them. The interpreter explains they have even more kamikaze volunteers than planes, but he does not provide much insight into what drives them. In the interpreter's discussion of kamikaze weapons, he focuses inordinately on the importance of the ohka bomb even though the last ohka attack in the actual war occurred one month prior to when two ohka bombs hit the Shenandoah. The author generally depicts believable characters, but the actions and temperament of Ben Casco turn out to be implausible at times. Most aircraft carrier commanders exude composure and confidence, but Ben sometimes acts so recklessly that it strains belief that he received promotions to executive officer of an aircraft carrier. Some of the wild stunts earlier in his career include flying his plane drunk under the Golden Gate Bridge, serving time in the brig for slugging his chief petty officer, and knocking out a lieutenant who he thought was the husband of the woman he had slept with the night before. When Ben takes command of the Shenandoah and disagrees with orders from the task force admiral to abandon ship, he grabs a gun and starts shooting at the waterline of a destroyer moving toward the carrier's side to transfer men off the burning ship. War fiction at its best! The Hero Ship has an exciting plot with many twists and turns, including an unexpected ending. While the kamikaze attacks with ohka glider bombs differ from historical facts, the book's realistic descriptions of battles, flights, and ships reflect the author's wartime naval service and pilot experience.